Not one word or update about environment in State of the State speech. Why? Scott Walker, governor of the state that gave the world Earth Day founder Gaylord Nelson, somehow gave a State of the State speech Wednesday with zero environmental content. Here’s the complete text of that speech, without a word about the environment. There’s certainly a lot that merits discussion. Walker has wracked up quite the negative environmental record over the last seven+ years – – including pro-polluter legislation, weakened Big Ag inspections, a trashed DNR staff, deleted science and slashed budgets, along with the official addition of 800 more contaminated state waterways and with new sulfide mining and wetlands fillings on the horizon. 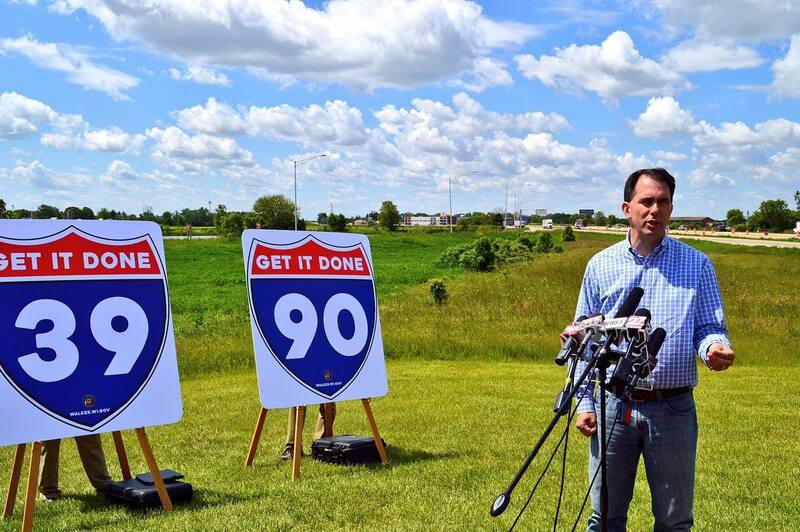 But let’s also credit Walker with a relationship with the environment – – though its more the connection of a wide-eyed tourist passing through Wisconsin than that if the duty-bound lead steward obliged to protect the people’s land, clean air and water. For instance, consider one of the many photos of Lake Mendota taken from the Governor’s Mansion that Walker is fond of posting on his Twitter feed. These photos are where Walker inadvertently discloses the gap between an iPhone’s momentary environmental appreciation and Chief Executive-level environmental commitment in the state that gave us not only Gaylord Nelson but John Muir and Aldo Leopold. That’s the UW-Madison campus across the lake, to the west. You can’t see it in the photo, of course, but on the campus shoreline sits a laboratory of an historic institution, the UW Limnology Center. Limnology is the study of lakes; the science was basically founded on the UW Campus and Lake Mendota is often said to be the most-studied lake in the country. Lake Mendota is not just your run-of-the-mill lake among Wisconsin’s 15,000. It’s is a huge, unique climate change laboratory where experts examine the lake’s temperature, depth, fish population, responses to climate change and other features widely studied for more than the postcard-pretty photo opportunity Walker likes to snap. Warmer conditions, especially in winter, are dramatically reducing the duration of ice cover, giving ice fishers less time to fish. Deer hunters are finding less snow on the ground during the gun season. Many brook trout streams are threatened by a warming climate. In lakes, dominance by the coolwater walleye is shifting to dominance by the warmwater largemouth bass. Several popular game species, like the ruffed grouse, are shifting their ranges northward and becoming less abundant. Increases in extreme rain events are increasing runoff from farm fields into downstream waterways and lakes, reducing water quality. High temperatures worsen health-damaging smog (ozone). The hot summer of 2012 produced very high ozone levels, worsening asthma and harming crops. Some key forest trees are declining in a warming Wisconsin, and the season for timber harvesting is getting shorter. Several tree species are threatened as warming allows more pest insects and diseases to move north. Wisconsin, specifically, has become much warmer over the past 60 years according to data from the Wisconsin Initiative on Climate Change Impacts. These warmer temperatures contribute to Lake Mendota’s warmer surface water. Every time Walker posts one of his Lake Mendota photos, he’s reminding people of how distant he and his administration are from the lake whose waters lap at the edge of his taxpayer-paid grounds. Waters that are being influenced by the climate change he’s denied, and which are connected to one of the state’s important watersheds that is among so many his environmental disregard has damaged. Which explains why he left the whole matter out of his State of the State speech, but which is visible in plain sight across Wisconsin from border-to-border. He didn’t mention anything in his rambling diatribe the other day for one simple reason. Republicans hate nature. WMC mostly doesn’t care about the environment except those that make money from it, therefore Walker doesn’t care either. There isn’t any campaign cash available if he did care so why bother.